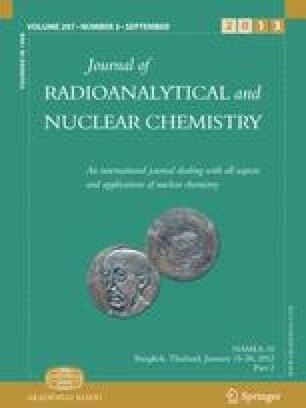 The formation of precipitates by hydrazine was experimentally examined in the simulated high level liquid waste (HLLW), which was composed of 9 elements (Nd, Fe, Ni, Mo, Zr, Pd, Ru, Cs, Sr). Palladium was precipitated over 90% above 0.05M of hydrazine concentration and at 2M HNO3, while all of the other elements were hardly precipitated. The elements of Pd and Zr were precipitated 93% and 70% in the simulated solution in which the concentrations of Zr and Mo were decreased from 0.069M to 3.45·10−3M and 6.9·10−3M, respectively, and the acid concentration was decreased to about 0.5M after denitration. In a Pd solution of 0.5M and 2M HNO3, the precipitation yield of Pd increased with hydrazine concentration and reached over 98% at 0.1M. The precipitation yield of Pd at 0.5M HNO3 was higher than at 2M HNO3. The Pd precipitate, formed by adding hydrazine to an acidified solution, was an amorphous compound consisting of Pd, hydrazine, nitrate and hydrate.